People who aren't me show you how they watercolor! I have to attend a funeral this weekend, so this entry is made up a couple real gems that I've been saving for a rainy day. There are a few illustrators whose blogs I'd follow just for their so-good-I-sometimes-want-to-cut-my-drawing-hand-off-and-mail-it-to-them-as-tribute art, but I have a special place in my heart for the illustrators that take the time to talk about their experience making art. Jillian Tamaki doesn't write very much on her blog, but when she does she often has something useful to say about what it takes to be an illustrator. 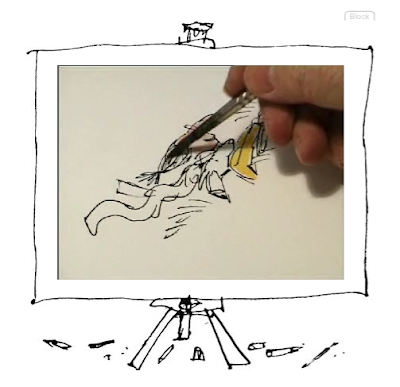 Recently illustrator Quentin Blake got a website, and I heard about it on Jillian's blog. You all know Quentin's work, even if, like I didn't, you don't recognize his name immediately. His wiggly line is what you picture when you imagine a Roald Dahl book. He illustrated Matilda, B.F.G., Willy Wonka, and literally hundreds of other children's books. It Looks like one of my process photos, right?! 1. While inking the final image on the light-table (with what looks like an upside down nib? 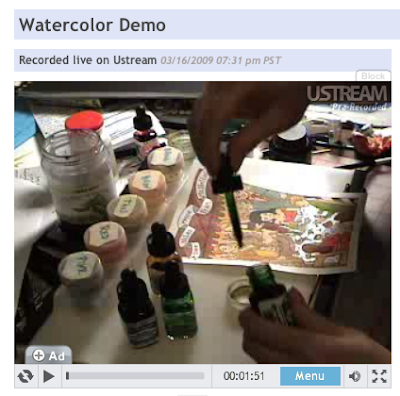 ), he is NOT tracing. He is redrawing using the underlying image as a rough guide. Nathan Fox spoke a bit about this when he visited my class a few weeks ago, as he inked over a very loose drawing. I think it's really important you CONCENTRATE when you're drawing and stay very cognizant about what you are doing. You should never be on "autopilot" when you are drawing. 2. Please observe that he will often do a piece several times. I do this too. If something isn't working, sometimes the best thing to do is to throw it away and start over. This is particularly important if "freshness" and "simplicity" is a vital aspect of your work. In many ways, "simple" is the hardest thing to do because you have nowhere to hide. 3. I have noticed that many students do not like doing sketches. Quentin Blake's work looks so free and loose, but please note the amount of planning and roughs behind his pictures. The fact is that illustrators are collaborators and sketches are the way we communicate with designers, art directors, editors, or whoever we're working with. Part of your process development should be finding a way to fulfill this step while still keeping things interesting and fresh for the final stage. And if that wasn't enough talent on video for you, here's Lucy Knisely doing a portrait of the cast of "The Nanny,", from beginning to end, in real time, explaining as she goes. It's around three hours of a great cartoonist doing her thing. hm, the nib looks right to me. Great post. Great stuff! A regular video feature would be awesome, but hellovahard thing to pull off. Lots of great useful info on this post! 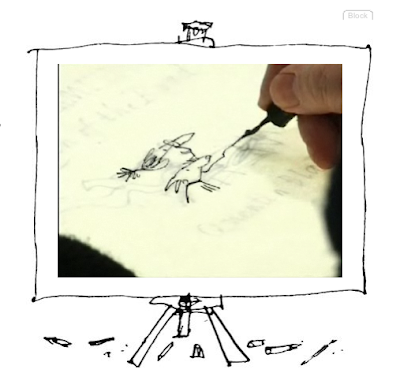 The Quentin Blake video was fascinating! Good find. Thanks for posting the Quentin Blake thing. I've been thinking about getting into watercolour for some time, and this has pretty well clinched it. Another artist who did direct inking on the light table was Bob Fujitani, the golden age comic book artist who went on to draw the Flash Gordon comic-strip in the 1970's and 1980's with Dan Barry as scripter. It's worth looking up those strips - some are in old Comics Revue mags. Yeah, he did that EVERY day, and told me that he did it so the work would be more spontaneous and look less like traced pencils. Could you talk about the Koh I Noor refillable drawing pens? You posted quills which was great but what about the technical pens. Joel if you mean Rapidographs just type that into the search box and you'll see an entry about Pointed Sticks where Matt explains that he doesn't use them. I haven't seen any mention of technical pens here since. If you go that route check E-bay for old ultrasonic pen cleaners. I bought a working one from an ex-draftsman for under $30. Rapidographs and other brands of technical pen are pricy, high-maintainance, and scare the bejeezus out of me. And the nail in the coffin is they don't do anything a bamboo stick or a ruling pen won't do, tools I'm much more comfortable with. I'll eventually have someone who likes them do a write up for me comparing different pens, but don't expect to see one from me.